This cold weather has us dreaming of sand, sun, and waves. We've rounded up some great products from Target to help you prep and pack for your next adventure. Beach trip here we come... at least in our dreams! Brandefy compares store brands (e.g., up & up) to name brands (e.g., Jergens) to show you when the generic is as good as the name brand, and to warn you when it is not. Our purpose is to help you save time and money, and to have a good time while doing it. 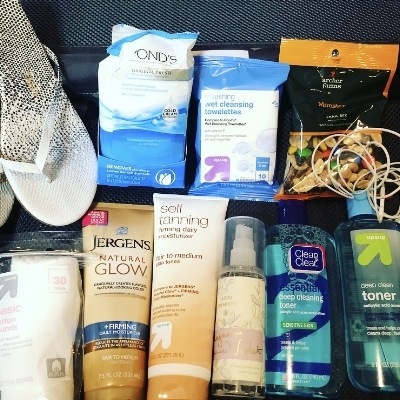 First off, if you are a little pasty like some of us Brandefyers, you will want to start preparing your skin with sunless tanner a few weeks prior to hitting the beach. Or course, we recommend the safer option of sunless tanner over soaking in UV rays. The up & up version of Jergen's Natural Glow + Firming scored an impressive 95% similarity score. 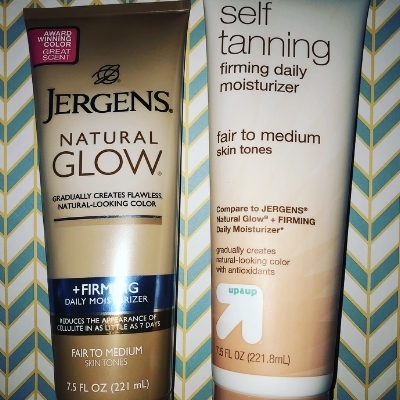 The generic moisturizer is $3.00 less than Jergens, and is almost exactly the same. The ingredient panels are 98% similar. They both have thick consistencies that rubbed in nicely. They gave us clean, even tans over time. The only noticeable difference is the smell. We actually preferred the smell of up & up to Jergens, as it was sweeter. We think you will love saving money and getting a little color with the up & up moisturizer. We also think your dermatologist would approve of the fake bake! Just because you haven't seen the sun in a few months, doesn't mean you have to look like it. Something you will want to take along with you if you are prone to sweaty, oily skin is toner. We at Brandefy love being warm, but that means we switch from dry winter skin to the exact opposite problem. To combat this, we recommend grabbing up & up's version of Clean & Clear Deep Cleansing toner. We gave this dupe a similarity score of 90%. Both toners have a pretty blue color and are 96% similar across ingredient panels. We liked how they evenly spread across the face and cleaned our skin with ease. Both toners have salicylic acid, so they fight acne that can pop up from sweat and oil. The only detectable difference is smell. The name brand has a more floral smell, and we preferred it to that of the store brand. The other factors were similar enough for us to make the switch and save $2.00. Where can we go to find water this color?? Of course, you will need something to help you apply your toner. In the travel section, we found a cute little pack of 30 cotton rounds by up & up. At $0.69 these are great to throw into your makeup bag and not worry about carrying a huge pack with you. We don't feel guilty blowing through these quickly. We do warn that they are not the highest quality, and we would NOT recommend using them day-to-day, but the size of this guy is too cute to pass up for your next trip. Is it normal to think travel size items are the cutest? Something you SHOULD definitely pass up on is a pack of the up & up version of Pond's towelettes. We thought the travel size of these guys for $3.69 was going to be a great addition to our travel list. Unfortunately these are only 40% similar to the Pond's towelettes. We are surprised they even say, "Compare to Pond's Cleansing Towelettes" on the package. The ingredient panels are only 25% similar. The Pond's towelette was thicker and had way more cleanser on it, making it much wetter than the Target towelette. The smell and feel of the towels is different as well. Luckily, we have done several reviews of the up & up version of Neutrogena towelettes in the past, and can save money with those instead! This generic is a no-go. Now that we know which tanning lotion, toner, and wipes to pack, it is time for the bonus round! We sampled the Archer Farms Monster Trail Mix and the Good Chemistry body spray. Both of these are Target brands, and who doesn't want to treat themselves with a road snack or a fun new scent?! 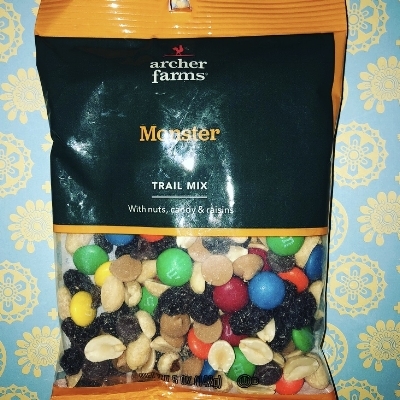 The Archer Farms mix comes with peanuts, M & M's, raisins, chocolate chips, and peanut butter chips- oh my! While this is not exactly healthy, we love a little sugar and protein for the road/ plane/ train. Plus, we are using the sunless tanner + FIRMING. That should negate our little treat. We'll share... even if we want to hog it all. If you haven't heard of the new fragrance brand for Target, Good Chemistry, run to your nearest store and get sniffing! They have some great scents that are reasonably priced. The darling labels and upscale florals make this line feel extremely high end. We purchased the Magnolia Violet Body Spray for just $9.99. We opted for body spray over regular perfume because it's a refreshing mist before you head out into the sun. If you prefer perfume, Good Chemistry makes that too. Some of our other favorite scents include Apricot Bloom and Vanilla Orchid; delightful. All the heart eyes for this new brand. Now that we are all packed, we are just waiting for someone to sweep us away on a vacation. Any takers?